Large vector art collection to download: vector illustrations, icons, symbols, decorations and design elements. Use these vector stock images for free for your graphic design, website or print projects. Vector graphics offer many advantages for graphic designers. They can be blown up to the desired size without loss of quality and you can edit them easily to fit your layout. Useful computer vectors, technology icons, interface graphics and web applications clip art. 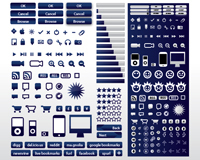 Increase the professionalism of your website, blog or social network page with this basic web icons set, available in 5 color versions. Make your web pages user-friendly, visually appealing and easier to navigate. Create your own blog theme or flash animation with these fresh communication and modern technology clip art, saved in Illustrator AI and EPS vector art format. 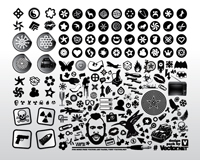 Black and white vector pack with creative signs, cute cartoons, funny icons, funky symbols, cult graphics and cool clip art images. Vector art compilation file with hundreds of vector illustrations for your design projects and print jobs. If you are looking for fresh design footage and original vector icons, you’ll find them here! 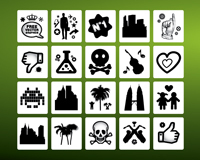 Cool vector icons are a basic requirement for illustrators, vector artists, graphic designers and web developers. Vector graphics are great because they don’t lose initial quality when scaled to custom sizes. 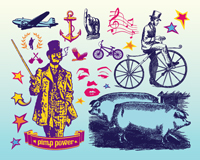 This vector set contains a compilation of modern lifestyle, social media, communication, technology, transportation, fauna and flora clip art saved as Illustrator AI and EPS files. 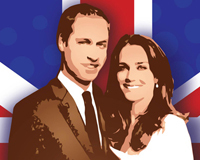 Royal wedding vector artworks of Prince William and Kate Middleton. Vector images of the young royal couple. Today is William and Catherine Middleton's big day, the moment of their long-awaited fairytale wedding: the ceremony in Westminster Abbey, the procession along the streets of London, the Buckingham Palace kiss, celebrations and festivities. Download free social media design pack with web 2.0 logos, glossy buttons and abstract shapes as vector art files. 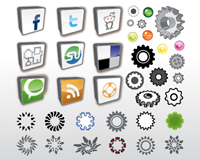 Free Facebook, Digg, Twitter, Reddit, StumbeUpon and RSS Feed buttons, gear illustrations and 3D glass graphics for your vector freebies footage collection.